Among the tie-dye T-shirts and trance music that has made Goa famous, Oryana Angel finds a refreshing slice of Portuguese culture. Outside the Basilica of Bom Jesus church, in the heart of Old Goa, a perma-tanned French hippy tells me that in the 1970s he and his cronies set up a temporary squat in the church’s back rooms, even dressing up in the World Heritage UNESCO site regal gear. Old Goa, or Velha Goa as it is called in Portuguese, is just an hour’s drive south of Anjuna Beach, world-famous for trance music, full-moon parties and a hedonistic lifestyle. Down the road in Old Goa, peacefully perched on the banks of the Mandovi River, there’s hardly a hippy in sight. Instead of yoga mats and doof doof music, Old Goa is crammed with sprawling Catholic churches and relics of a once thriving Portuguese India. During the 1500s, the now dilapidated town’s heyday, Old Goa was the capital of Portuguese India and bigger and more powerful than Lisbon and London. But a run of bad luck – cholera and a clogging up of the port – brought an end to the city’s glory days. Like most fallen cities, Old Goa has plenty of ruins to explore. The biggest are St Augustine, just up the hill from the Basilica of Bom Jesus. Once a sprawling megalopolis of eight chapels, four altars, a convent and church, today the site, known as Holy Hill, is a shadow of what it once was. The standout structure is the skeleton of a four storey, 46-metre-high bell tower (minus the bell, now happily ringing in the Church of Our Lady of Immaculate Conception down the road in Panaji). St Augustinian friars built the site in 1602, but it was left for dead when the Portuguese outlawed the mission more than 200 years later. Fallen bricks and mortar surrounding the tower only hint at the grandeur that once was. Today, a battle wages between the ruins and the Indian jungle; tree roots wend their way between what is left of the structures. Sitting on the ancient rocks, I’m amazed by the steady stream of Indian women excavating the area by hand. Wrapped in colourful cotton saris, they gracefully balance boulders atop rolled scarves on their heads. It is yet another reminder that in India things are so different. The whole southern state of once Portuguese-controlled Goa feels poles apart from the rest of India. For one thing, 30 per cent of the population is Christian. One of the things I love about Goa is watching the vibrant white Portuguese churches and monuments make way for neighbouring Hindu and Muslim villages, before they begin again. Before the Portuguese, Old Goa was the capital of the Bijapur Sultanate. In the compound of what was once the home of Adil Shah’s palace and mosques, in the heart of Old Goa, Se Cathedral takes pride of place. 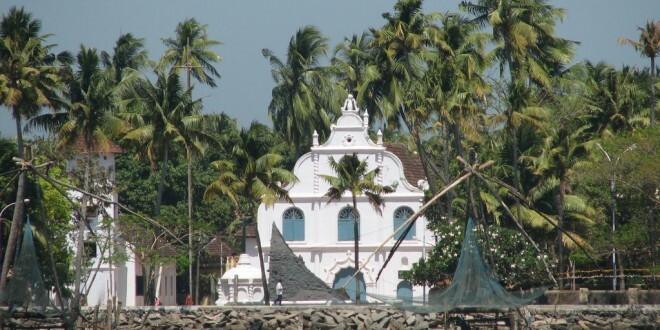 Built to mark victory over a Muslim army and the subsequent taking of Goa, Se Cathedral is a sign of the wealth and power of the Portuguese when they arrived. The Tuscan-looking cathedral dwarfs even the largest churches in Portugal. More than 75 metres high and 55 metres wide, it is the largest church in Asia. It is also one of the most sacred buildings for the Christians and like much of Old Goa, it is a World Heritage-listed site. Inside, a wall of carved gold panels stretch all the way to the regal domed ceiling and tell the life of St Catherine. One of the cathedral’s five bells is the famous Golden Bell, the biggest in Goa and one of the most famous in the world. How something so beautiful could come from something so ugly never ceases to surprise – the Golden Bell was used during the Goa Inquisition, which saw the trial of more than 16,000 Indians (many of whom were killed or punished for not converting to Catholicism). With so many ancient sites so near the famous beaches of Anjuna, Vagator and Baga, it’s surprising the place isn’t full of tourists. I put this down to the fact there are more World Heritage buildings than places to stay. Unfortunately, the Old Goa Heritage View hotel is not built in the traditional Portuguese style of Goa. But it’s central, clean and has a restaurant. The food in Old Goa also harks back to the area’s unique heritage. Visit any traditional Goan eatery and you’ll be sure to find fish curry rice on the menu. Fresh seafood is easy to come by, even if it’s bought directly off the fishermen at any of the jetties that dot the coast. Dishes such as caldeirada (Portuguese fish or prawn stew) are common, as is racheiado, a Portuguese-style delicious whole fish – usually mackerel or pomfret – filled with spicy red sauce. Back at the Bom Jesus Church the laissez-faire days of open doors – and open caskets – has come to an end after a few incidents. Wildly popular Roman Catholic missionary St Francis Xavier’s body used to be on display until an over-zealous Goan woman bit a toe off his decaying body. Looking at the (surprisingly short) remains of the saint, now encased in a protective glass box, two young local Goan boys with beaming smiles seem to be a lot more interested in where I am from than the saint’s healing powers or the baroque church’s stunning marble floors which are inlaid with precious stones. For most Catholic Goans though, the deceased holy man and Old Goa is their most spiritual place. For visitors, it’s somewhere you can imagine the ancient Portuguese trader ships packed with luxury goods, and almost hear the whispers of those who once lived there.